Have you ever asked yourself, do I really need to save money for adoption? Can’t I just fundraise and apply for adoption grants? Or maybe you’re adopting from foster care and the cost to adopt is low so you don’t think you need to worry about saving money for adoption. Not so fast. Keep in mind, as you send out support letters, share your story, direct supporters to your online fundraising profile, and apply for adoption grants, others are watching. Like it or not, people will think twice about donating to your cause if you aren’t committed to make your own personal sacrifices and save money for adoption. For example, you probably shouldn’t be posting pictures of your luxurious family vacation while you are fundraising for adoption. It’s common sense, but families do it all the time. Grant organizations are watching too. Before awarding a grant, they review total household income, expenses, assets and liabilities, and want to see that you have demonstrated financial stewardship and commitment, which may include a second job or earning extra income, budgeting, fundraising, applying for several grants and anything else that shows your willingness to save money for adoption. Even adoption from foster care requires planning and financial savvy. If you’re like most families, the added cost of a new baby or young child in your family can easily exceed $12,000 per year. While you may not need the money to pay for the up front cost of adoption, you can get a head start by adjusting your budget now so your increased expenses don’t sneak up on you later. Sure, there are thousands of creative, boring, and downright ridiculous ways to save money for adoption. 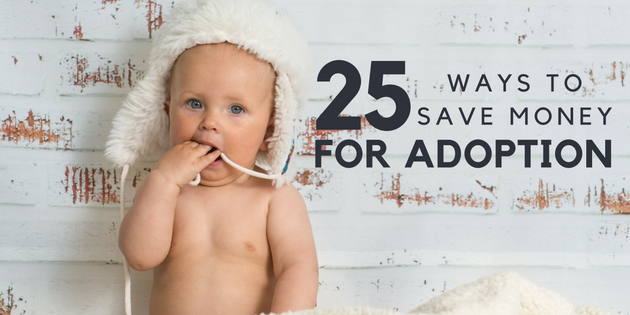 But rather than waste your time listing every single one of them, we did some research and talked with other families to give you a good mix of our 25 best ways to save. These will put your creativity, resourcefulness, and self-control to the test. Some of these money-saving ideas are a no-brainer while others require more work and sacrifice. With the right motivation and a bit of determination, you can probably save enough to make a nice dent in your funding goal. You might even become a financial superhero! Start by picking a few ideas that interest you and testing them out. I bet if you stick with it for 6 months, your attitude toward saving will change and your bank account will increase with minimal effort. Without further ado, here is our list. Nearly 70% of Americans have less than $1,000 in savings. Since you are preparing to adopt, make it a priority and a habit to save money. Set up automatic weekly or monthly transfers to your savings account at your bank or credit union. If you are a techie looking for a more efficient way to save, check out Digit. It’s like a smart online change jar that checks your spending habits and removes a few dollars from your checking account if you can afford it. You’ll save even money for adoption without thinking about it. If you love the convenience of online shopping, then Ebates is an ABSOLUTE MUST. It’s truly free money. All you do is hop on Ebates, find the online merchant you want to purchase from, then click on “Shop Now” to be redirected to that site. Ebates will credit your account with the amount in cash back after your purchase and will periodically send you a check in the mail for the amount you earned. Think cash back from Amazon, Target, Apple, Overstock and Wal-Mart…they are ALL there. Every time you get an Ebates check in the mail, deposit it into your adoption fund and continue to save money for adoption. One of our favorite ways to save money for adoption! Since we starting using cash back credit cards consistently back in 2012, we’ve earned thousands in cash and airline tickets. If you spend responsibly and pay off your card in full each month, you can reap the rewards! If you’ve already decided to make a purchase, why not buy online using Ebates and pay for it with your cash back credit card. Every time you receive cash back, deposit the funds into your high yield online savings account and maximize your savings. If you have neighbors or friends that drive in the same direction for work or school, figure out a transport system that works for both of you. Or consider using public transportation if it’s available and apply that extra gas money toward your adoption fund. Keep a change jar in high traffic areas of your home. Periodically roll all the change and add it to your adoption fund. Every penny counts! If you are serious and want to save money for adoption, then you need to have a plan. There are several great online budgeting tools that link to all your accounts, track your spending and help you save. Our favorite online budgeting tools that we recommend are EveryDollar and Mvelopes. Both offer free and paid versions. The paid version will cost you about $10 per month but it’s worth every penny. The key to creating a budget and saving money, though, is to actually follow it. Do you have what it takes to challenge yourself and your family to save? The premise behind the 52-Week Adoption Savings Challenge is simple. Commit to save for 52 weeks starting with $1 in week 1 and increasing by $1 every week. By the end of 52 weeks, you will save a total of $1,378! The Freecycle Network is a grassroots, nonprofit movement of people who are giving (and getting) stuff for free in their local towns. It’s all about reusing and keeping good stuff out of landfills. Freecycle can be hit or miss, especially depending on where you live, but if you’re willing to search, you can save money and find some diamonds in the rough. Do you have high-quality, gently-used baby and children’s items sitting around your house? Clean out your closets and put money in your pockets, all at the same time with consignment sales! Check out Consignment Mommies for consignment sales in your area. Get up to 30% off when you buy discount gift cards for your favorite brands. Cardpool also offers a great way to exchange unused gift cards for cash. Let’s say you budgeted $50 to eat out. You can purchase a $50 gift card to a restaurant for $40 and transfer the remaining $10 to your savings or adoption fund. Do this for various purchases throughout the year and watch the savings add up quickly! We started testing various meal plans about 5 years ago and it has been a game-changer for our family. Not only does it save me time and help me to avoid that afternoon stress called “what-in-the-world-am-I-going-to-cook”, but it cuts down on our monthly food expense. I only buy what I need for the week to cook the planned meals, limiting food waste, but it also limits how much we are spontaneously eating out because of poor planning and kitchen stress. There are a lot of great meal planning apps and websites out there; find one that works for you and commit to making this happen! I LOVE food! I love eating out even more, but let’s face it…eating out is EXPENSIVE. While you’re fundraising for adoption, consider eliminating your eating out during the workday and take your lunch with you. You could easily save well over $100 per month just by making this one change. Have you thought about how much money you spend on soda, coffee, tea, juice, beer and wine? Consider cutting way back and focus on consuming water (and not the really expensive kind in the fancy bottles). Water is healthy and our bodies need it to function properly. We should all be drinking a lot of water, but many of us don’t consume the proper amount each day. If you don’t have the discipline to stick to water all the time, at least cut out the soft drinks and alcoholic beverages when you go out to eat and you’ll save a bunch over time. If you can’t survive the day without a good cup o’ joe, then invest in a coffee maker and large coffee mug. By eliminating your daily visit to Starbucks, you can instantly save $50 or more each month. Some people think you can’t buy quality coffee beans at a decent price, but we found that World Market has amazing coffee with reasonable prices. Plus, if you join the rewards program, then you will receive offers for free coffee and you can load up. Do you have an unused bedroom, finished basement, or in-law suite in your home? Consider renting out this space on AirBNB. You can also be a host for someone else and earn extra money without having guests stay in your house. I was shocked when I first learned about this. I had always gone to one pharmacy thinking that prices are the same everywhere. Boy was I wrong! ALWAYS go to GoodRx and compare prices of prescription drugs. GoodRx will show the lowest price at each pharmacy near you. For example, one pharmacy has a prescription for $3 and another one down the road charges $45…seriously. Don’t be loyal to one pharmacy; have your prescriptions transferred to wherever you can get the best deal. When we were preparing to move our family to Congo, we turned to GoodRx and saved $982 in prescription costs! Did you know you can buy a digital antenna box for about $25 and pickup the local stations without having to pay that hefty $95 or more each month for cable or satellite? Consider cutting cable and signing up for Netflix or Hulu to save money for adoption. You’ve lived on that lower income before, so fight the urge to up your spending when you get some extra cash! While you’re adopting, consider using that raise or Christmas bonus toward your adoption expenses. So much energy is wasted by Americans each year! If you’re out of your house for hours at a time, adjust your thermostat to prevent it from constantly running to keep your house cool or warm. This can save you hundreds of dollars a year in utility bills. If you’re going to the store, have a list and only allow yourself to purchase items on that list. Don’t buy on impulse. If you see something that you want or think you need that’s not on the list, leave the store and ponder that purchase for a couple days. More times than not, you don’t actually need the item and will keep those dollars safely in your wallet. If there’s something that you do need to buy, take a bit of extra time to do some comparison shopping before you make the purchase. Check out ShopSavvy and BuyVia. Both apps will show you where to purchase for the lowest price and will even send you price alerts for specific items and categories. Shop around and save money for adoption by reducing costs on the services your family is paying for every month. Auto, life, health, and homeowners insurance are the big ones. Find out what your rates would be from top carriers individually or bundled. Some families have reported savings over $1,000 per year after making a switch. There are so many consumable items in our house that we could easily make if we just put a little time and effort into it. For example, we started making our own laundry detergent a few years ago. For about $30, I can purchase all the supplies I need to make the detergent and will have enough to last six months. Consider items you could make: candles, laundry detergents, dish soap, wet wipes, surface cleaners…the list is long! Pinterest is a great place to search for these recipes and how-to’s. What are your favorite ways to save money for adoption? Child Advocate. Entrepreneur. Fitness Junkie. Mommy and Wife. Lori is an adoption fundraising coach that provides creative strategies and resources that empower families to adopt without debt. 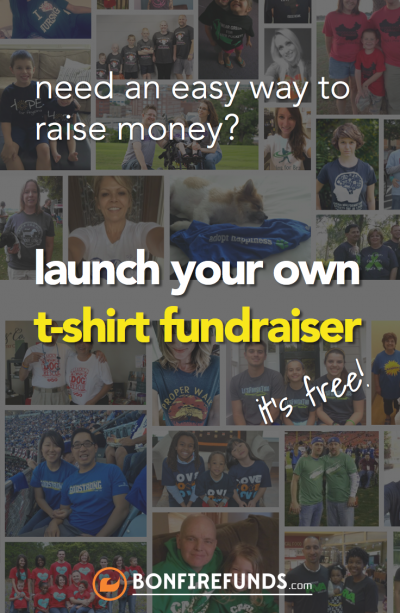 Use the system we created to raise over $47,000 and adopt debt free! We're Lori and Jeremy and these are our 3 kiddos. 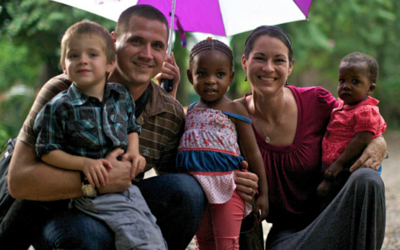 We lived in Congo for 18 months to finalize our CRAZY adoption! We're glad you stopped by. 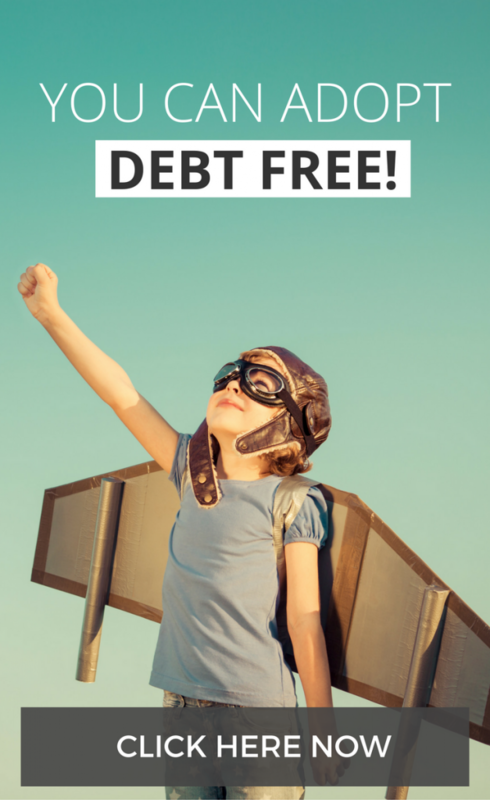 Check out our latest project that will help more families than ever adopt debt free!